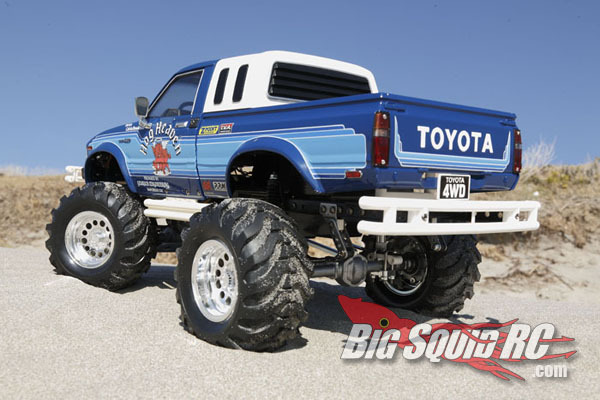 Everybody’s Scalin’ – Imagine Scaling in the 90’s « Big Squid RC – RC Car and Truck News, Reviews, Videos, and More! When talking about modern amenities like brushless and lipo, I’ve often poked fun at how different scaling would be should those not exist. For laughs, let’s talk about what scaling probably would’ve been like, would it of gotten popular sometime in the 90’s. First of all, a big trail run would be a heck of a lot smaller than nowadays thanks to AM/FM radios. Showing up at a run with your friends would probably first require swapping out radio crystals so everyone could have their designated frequency for the day. Even with that, 4-5 people would probably be a big group. How long would runs be? Well, going by typical NICD and NIMH batteries of that era…not very. I’d reckon that 30-60 mins would be the norm, with the latter being reserved for those that took several batteries and allowed ample time for vehicles to cool. Batteries experienced the nasty “loss of power” curve where after the first few minutes of use, vehicles got very sluggish. ESCs back then were also in their infancy as mechanical controllers were commonplace. Yeesh, now there’s a thought- trying to crawl with of those infernal mechanical getups where anything other than WFO throttle created a ton of heat. No drag brake either, of course! Most rigs would probably be supporting gnarly atv-inspired tires with pin spikes that look like they belong on a Mad Max vehicle, or suffer with better looking but hard-as-a-rock Tamiya tires. Heck, even the aftermarket stuff back then was pretty stiff compared to the ultra soft rubber of today. So what would one be doing on one of these trail runs? Because of all of the issues and conditions mentioned above, actual rock crawling would not be feasible. It would be driving on the open trails where the craziest obstacles one would be able to tackle would be a particularly bumpy tract of terrain or maybe small hills. Ya know, after trying to rationalize how this would work, I’ve come to the conclusion it wouldn’t. Scaling/Crawling is something that could’ve only come of age for the mainstream when it did thanks to all the associated technologies!